43 percent melt: This NASA satellite image from July 8 shows 43 percent of the Greenland ice sheet was melting.Courtesy NASAJohnny Carson used to have a standard round of jokes for the summertime on his Tonight Show. "How hot is it outside today? It's so hot (insert punchline)," was the standard humorous convention he would use. NASA researchers have a new take on how hot it is this summer, and it's not that funny. Satellite photos taken this month over Greenland show that the massive ice sheet that covers almost all of the Arctic region island was now melting at some degree earlier this month. Like the tried-and-true diet ads in the back of magazines, NASA has before and after satellite images that show the extent of melting that happened. The top image, complied from three satellite photos taken on July 8, show about 40 percent of the ice sheet's surface was melting. 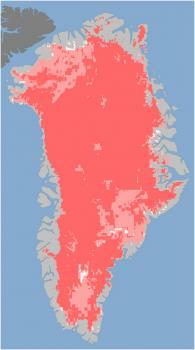 Areas that are pink show where melting is occurring. 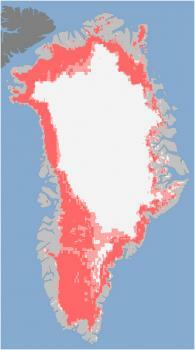 Areas that are white show non-melting ice and areas that are grey have no ice cover. 97 percent melt: This satellite image from July 12 shows the melt rate surging up to 97 percent.Courtesy NASAThe bottom image, taken on July 12, shows a rapid acceleration of melting on the island, with 97 percent of the ice sheet melting. It's a surge in melting rates that scientists figure happens about once every 150 years. This month's data is the highest melting rate that NASA has seen in Greenland since satellite data has been collected for about 30 years. A rare warm front stalling over Greenland is the cause of the high amount of melting and by the middle of the month, that front had moved on and things were getting back to normal. You can read the NASA press release about this weather event here. While the brief massive melting is unusual, it's not a huge immediate threat to Greenland's ice sheet, which is some spots is more than two miles thick. In other recent Greenland ice sheet news, a huge chunk of coastal ice broke off and is now adrift in the Atlantic Ocean earlier this month. 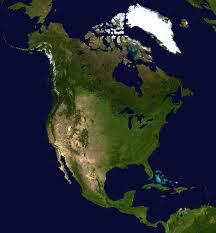 Measuring 59 square miles, the ice sheet is twice the size of Manhattan. You can read more about that story here. Two years ago, an iceberg twice as big as this year's broke off from the same location. Experts say it's extremely rare to have two huge icebergs break loose in such a short amount of time. A composed satellite photograph of North America in orthographic projection.Courtesy NASAThe March 30 issue Science summarized an article in a recent issue of Geophysical Research Letters with significant implications for human welfare. Many climatologists have expected that extreme weather events will increase in frequency and intensity as human activities continue to increase the concentration of heat-trapping gases in the atmosphere. 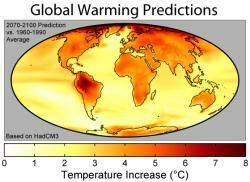 But how in particular could global warming exacerbate extreme weather? 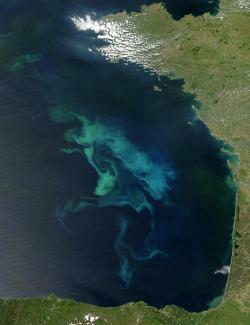 A couple of processes have been identified that are impacting North America. 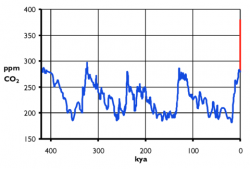 First, the increasing melting of Arctic sea ice in summer means that a tremendous amount of solar energy that in the past was reflected back into space instead is absorbed by the ocean, which in turn warms the overlying atmosphere. Second, snow cover is melting earlier across much of North America and so more solar energy goes into drying out soils. These two processes – Arctic sea ice loss and the heating up and drying out of the interior of the continent – interact to slow the passage of weather systems from west to east across the continent, thereby strengthening their impacts. 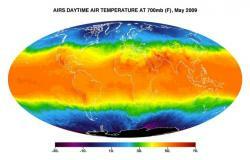 Scientists are beginning to figure out how global warming can end up impacting our daily weather. How do you make a better model? In the public media, the impacts of global warming have been less important than questioning its causes. And at any rate, reports on the impacts have alternately a catastrophic immediacy or an ambiguous, amorphous quality--the latter likely born out of caution due to the former's inaccuracy and tendency to undermine action. But there's room for a third approach--one of reasonability and inquiry. And in fact, scientists' explorations go beyond the intangible models of earth covered in gradations of 5 colors, which represent average temperature change over the last century. 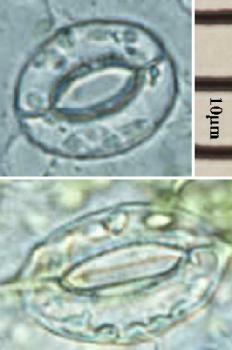 Their work tests changes in the real world with real organisms. This field work generates data that can be used to test and improve the accuracy of the earth systems models we use to predict future change. One such project is literally heating up wheat fields and spraying CO2 over them. The researchers want to find out how global warming and increasing concentrations of CO2 will impact crops. It turns out that plants will react to these changes differently in different latitudes and climes. For example, plants in warmer climates might grow better earlier in the year only to take a dive once summer temperatures pass a certain range. Plants in cooler climates might thrive with warmer temperatures and increased CO2, whereas tropical plants might suffer from too much heat. "There is a narrow latitudinal band that could make rising heat beneficial to growers, Kimball concluded. But farther south, especially in Mexico, the implications of the warming mean serious reductions in crop yields." The information gleaned in these plant studies is helping validate and improve existing models of vegetation so that the tools we need to make decisions about climate change are more accurate. One of the researchers in the article implies that we need a lot more of this validation than we do predictions right now. Even so, changes in reporting on climate change's impacts are often due less to increased uncertainty and more to increased information. So it seems that rather than the impacts of climate change being universally good or bad, they're a little of both in different parts of the world. What can we do to improve communication in the media on this front? And to take this a step further, given the varying environmental responses to global warming, it is ethical for one country to make decisions about climate change without consulting other countries?